While many will discuss whether Christians should even participate in Christmas celebrations (which is discussion worth having) one thing thing we all agree upon is that almost 2,000 years ago Christ took on human flesh and was born into this world. The Incarnation is truly one of the greatest miracles of God. Divinity took on humanity, He became like us. But He did not do this for a parlor trick, or because He was bored. Christ became man so that He could die for us. God took on flesh so that He could be executed in our place, to pay the price for our sins. Then He rose three days later, proving His power of death and giving a promise of eternal life to those who would repent and trust in Him. First came the Rubber Ducky Nativity, now here’s this gem depicting the birth of Christ. Nothing says Christmas like psychedelic frogs, eh? Christmas is exactly two months away and we already have this year’s wares being peddled by the den of thieves of Christian marketing. 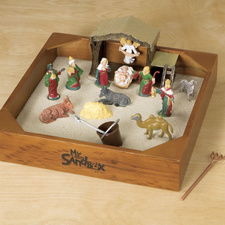 Here is their latest debacle: the Nativity Sandbox.